We are in business now! The Locost frame is under construction and it's been so exciting we haven't even had time to stop and post an update. Sorry about that. Encouraged by our early welding success with the nose tubes, we rented a truck last Friday and picked up all the parts we needed for a build table. Which we then built. 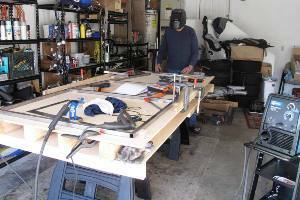 On Saturday we dug through our box of metal bits and pulled out all the tubes for the bottom of the frame, then carefully laid them out on our build table and tacked them all together over the course of the next several hours. 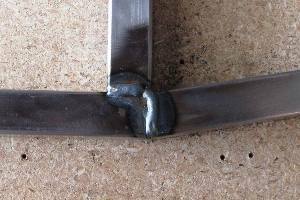 Although the bottom frame tubes looked excellent all stuck together like that, there was only a single tack weld at each joint so the frame wasn't what you'd call extremely rigid. Which wasn't encouraging considering all the weight this thing would have to carry someday. But we were able to flip the frame over without damage, and tack the bottom of each joint, which helped a lot. The frame still wasn't completely flat, but it wasn't off by more than a quarter inch anywhere, and I'm sure that'll get worked out when we add more tubes. Also, as you know, we have hammers. Some welds are even better than this. Honest. The good news is, we may finally have this welding thing under control. I'm not sure why it's so easy now to see what's going on under the helmet. Maybe we didn't know what we were looking at before. When you're gas welding, you're just wearing goggles and the puddle is bright yellow. You can't miss it. Under the helmet the puddle is nothing but a faint red glow, which is confusing to the novice. Lately the puddle has gotten easier to see, however, and the last couple of welds were eerily impressive. They looked like someone else did them, which is the highest compliment we can pay to a weld. On Sunday we tacked on the uprights, a.k.a. H-tubes, to the bottom frame rails, as close to 90 degrees as we could get them, and then clamped on the upper frame rails (J-tubes) and the nose assembly (L-tubes). 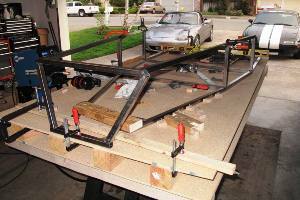 Without any adjustments, the upper frame rails met the nose at exactly the right height and distance from center. It was so close I was sure we'd done something wrong, but a quick check of the mock-up frame confirmed we had all the tubes in the right place. So we tacked them together and ended up with somthing resembling a car frame. I may have made that sound too easy. Let me disabuse you of that notion right now. 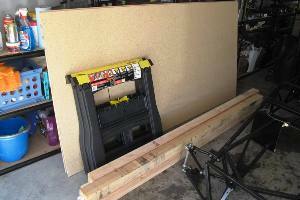 First of all, besides the welding, there was a lot of measuring, clamping, drilling, measuring, adjusting, grinding, and measuring involved. Also a lot of measuring. We basically had to turn the build table into a large jig, with wood blocks screwed to the table to keep all the tubes in their precise locations. Which is why the 12 tack welds needed to join the bottom frame tubes into a single unit took over 4 hours. We didn't have to jig the frame to tack the bottom, but each of the bottom joints needed some judicious clamping to bring the tubes back to square. Welding the top joints had caused the side tubes to splay out a little, and we couldn't allow that. Also, each of the bottom tacks had to be ground down with an angle grinder so the frame would sit flat on the table when it was flipped back over. So tacking the bottom took a few hours, and also got me thinking about getting a new grinding disc. I like our new Harbor Freight grinder, but I don't think they spent a lot of money on the disc that came with it. What an actual Locost frame looks like. Sort of. Now that the frame is starting to take shape, it's beginning to feel for the first time like we're actually building a car, and not just making parts for a car. Even though it's only tacked together, and far from complete, this frame is way cooler than our old mock-up frame. You can sit in this one and not worry about breaking anything. Plus, it's shiny metal. Over the next couple of weeks we hope to have all the rest of the tubes tacked on, which will make sitting in the frame and pretending to be racing down the Mulsanne straight a lot more realistic.